Thanks to the charity work of Auburn grad Ericka Jackson, a group of Swazi preschoolers have some new clothes— a new favorite football team. Auburn graduate Ericka Jackson (whose face, if memory serves, once graced the sides of several Tiger Transit buses), recently stopped by a Bama Fever / Tiger Pride store to pick up a few Auburn souvenirs. She left with a huge box full of Auburn shirts, Auburn socks, Auburn pants, Auburn hats, Auburn toys. That’s what happens when you tell store managers in Alabama that you’re heading back to Africa for more volunteer work with orphans. “We typically don’t take ‘in kind’ donations overseas, but I definitely made an exception that day,” Jackson wrote last week on her personal blog. Jackson is co-founder of children’s charity The Sound Of Hope which is currently partnered with programs caring for children in the east African nation of Swaziland, as well as similar organizations in India, Thailand and Burma. The fashion show of course included lessons in Auburn cheers. You can see more photos and watch Jackson lead the kids in a “War Eagle” here. For more information on The Sound Of Hope, visit them online at www.thesoundofhope.org. Related: South Korean grade schoolers predict Auburn BCS blowout. Thanks for posting this, guys. Ericka’s face was indeed on the side of Tiger Transit buses for a time. She is a good friend and we were coworkers at the front desk of the Auburn Admissions office for a few years as well. Thank you TWER for featuring this story on your blog! What an honor! I really appreciate the links for The Sound of Hope too. We would LOVE to have more Auburn Fans & Alumni donating and getting involved in our work! 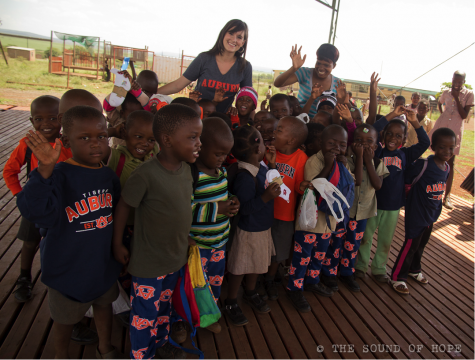 As the Auburn Creed states – “I believe in the human touch, which cultivates sympathy with my fellow men and mutual helpfulness and brings happiness for all.” It is amazing to be able to touch the lives of children in need around the world through our charity. 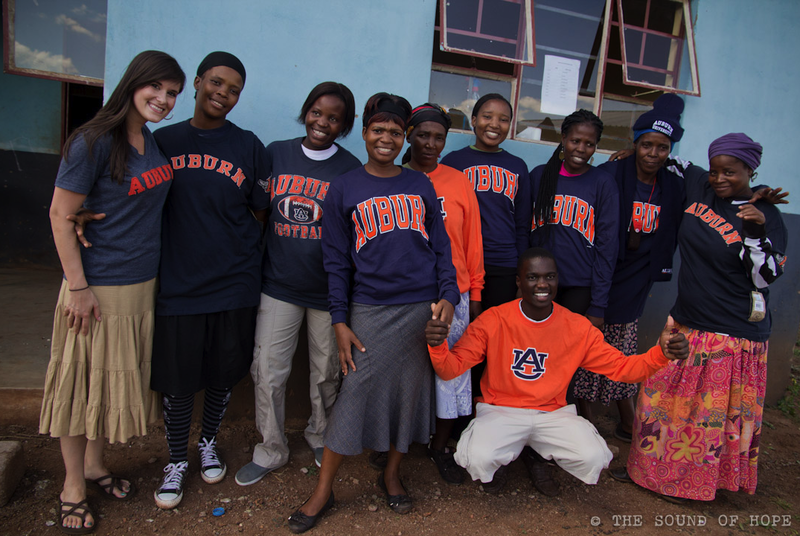 …and of course, I always try to spread a little Auburn Spirit wherever we go! What a beautiful and heart-warming story! Thanks to TWER for sharing it and Erika, wow – what amazing work you are doing. God bless you!